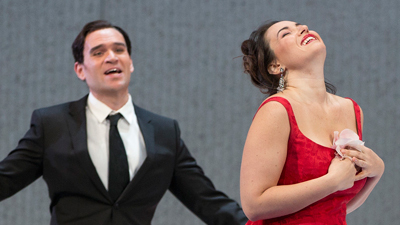 Soprano Patricia Racette is deeply moving as Violetta, the courtesan of the title and one of Verdi’s most beloved creations. Marcelo Álvarez sings Alfredo, the young man whose devotion and honesty make her give up her life of endless partying. They leave the city of Paris together—only to have their idyllic existence shattered when Alfredo’s father (Vladimir Chernov) forces Violetta to renounce his son. Heartbroken, Violetta returns to her past life, leaving a shattered, uncomprehending Alfredo behind. Only when it is too late does he learn the truth. 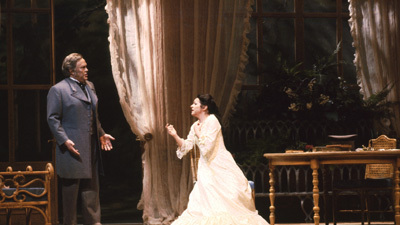 In one of the great reconciliation scenes in all of opera, Alfredo and the terminally ill Violetta are reunited—just before she dies in his arms.